Anomalous Azumarill! Pokemon One a Day, Series 2! From mouse to rabbit, we switch styles as we do of base animal for the oblong Azumarill! Today's illustration features more buttons than you can shake a stick at! Why would you shake a stick? Dunno, it's an expression of sorts. I would say today's work is a remix born from semi-inspiration from Series 1 Zubat! So why buttons? Well, it starts with association as many ideas and styles for this series are decided through finding any and all correlation I can during the brainstorming process. 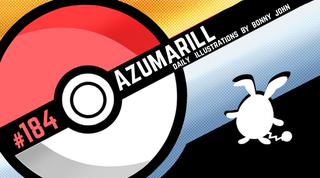 At first I thought maybe I could utilize the white of Azumarill's body with the canvas with negative space. It was unfortunately way too simple and boring and I couldn't really work anything out of it. More importantly, it wasn't inspiring to work on. Eventually, I made a connection to buttons with the round spots on the body and thought from there I could build up an impressive looking form in collage. The piece actually didn't even take too long to create. It was more about patience and determination to see it through. I found buttons via Google and made hundreds of duplicates and shifted around the size and colors (limited palette saves the day) and the work speaks for itself from there. 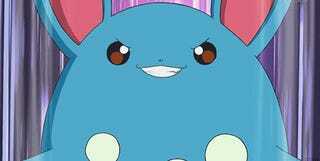 If you could design a Pokemon to evolve into a new animal unlike it's starting phase, what would they be and why?